Bill is seen here with Sookie on the season two finale of True Blood. Shortly after this scene, Bill gets kidnapped. Maryann wears a wedding dress as she attempts to marry the god that comes in the season two finale of True Blood. You will be missed crazy pants. Maryann gets ready to summon her god who comes in the season two finale of True Blood. Makes sense she's wearing a wedding dress. She is crazy after all. Bill and Sookie may possibly be the sexiest couple on tv. At least the sexiest vampire-telepath couple we've ever seen. Bon Temps' resident crazy maenad, Maryann, gets prepared for her wedding with poor Sookie stuck being one of her bridesmaids. Hoyt continues to argue with his mother during the season two finale of True Blood. He better get back together with Jessica or he'll be answering to us. 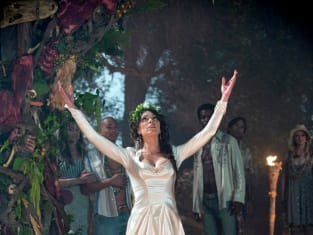 The crazy maenad Maryann wears her wedding dress as she attempts to seduce Jason into her crazy ways in the season two finale of True Blood. It's all come down to this for Bill. 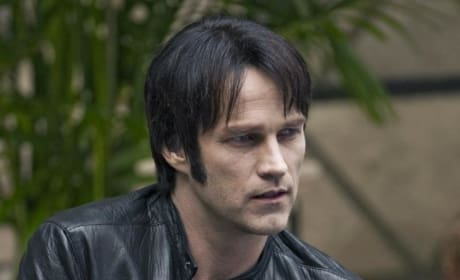 On the True Blood season two finale, he must place his trust and his life in an unlikely source.